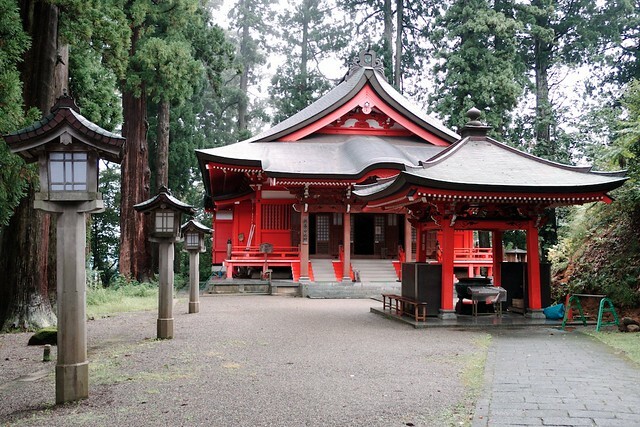 In Japan, shrines are Shinto and temples are Buddhist. 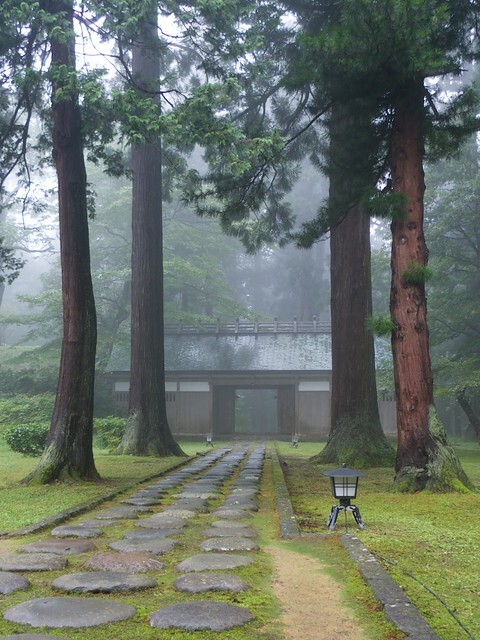 While Zuigan-ji is thoroughly let's zen (rinzai sect - same as the much posted about Zuisenji in Kamakura) the templey shrine on Haguro-san was built at the time when someone influential decided that Shinto gods were cool for Buddhists too. 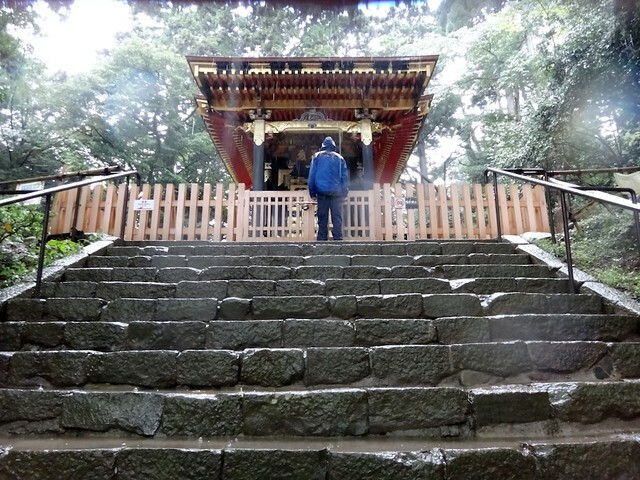 Later on the templey shrines and shriny temples were re-segregated, so I suppose that the shrine on Haguro-san is now officially Shinto. It still has a flavour of Buddhism about it - most obviously in the Shojin-ryori-ish nature of the food served at the hostel. 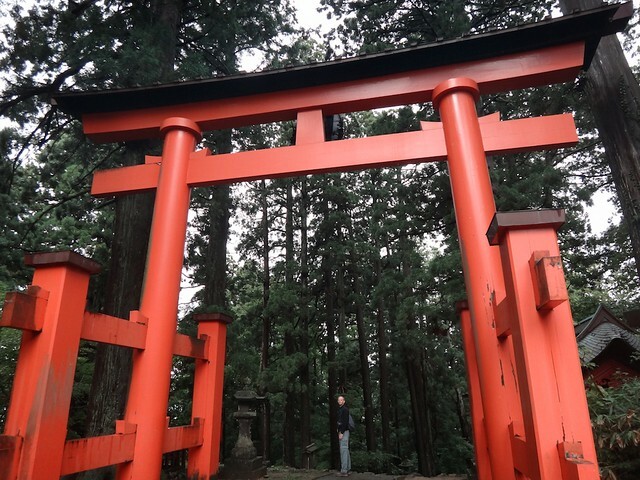 is followed by a walk round the shrine. 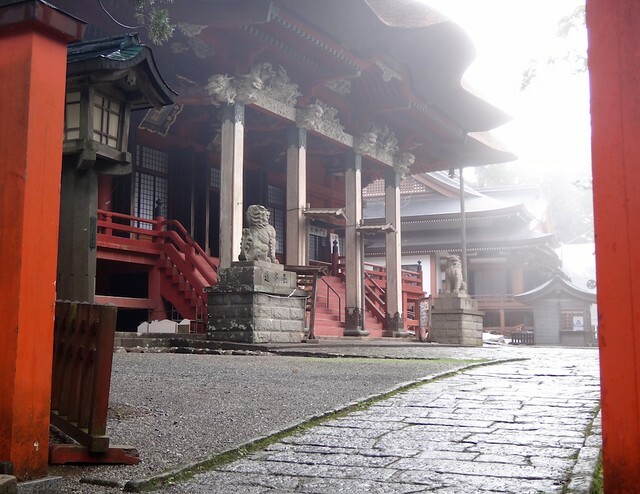 A couple more photos taken in Zuigan-ji, Matsushima, where we went on almost our wettest summer holiday ever (It might even have been the wettest ever in terms of inches of preciptation, but the Outer Hebrides beats it handsomely in terms of cold rainy desolation). James in the rain. 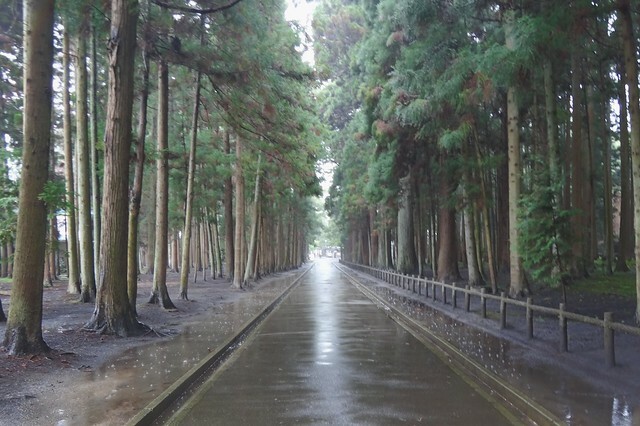 Please look only at the rain, steps, fence, James, and trees. There's a no photography sign on the fence, which surely cannot apply to those particular elements. A witch and her broomstick. Perhaps it was a little less rainy under the trees, but by now I was learning to shade the lens with a finger to keep rain drops off. Just got another email from Peace Boat: it sounds like they are struggling to find enough volunteers to keep their operation going. The general use campsite appears to be shutting down at the end of the month, so more ad-hoc operations (eg) might also find life difficult (PB has accommodation in a couple of disused buildings). 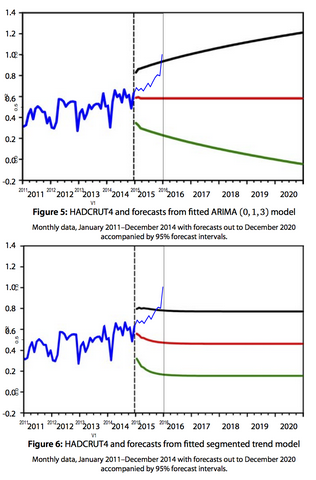 So this might be more or less the last chance for anyone who has been thinking that they ought to get around to it. 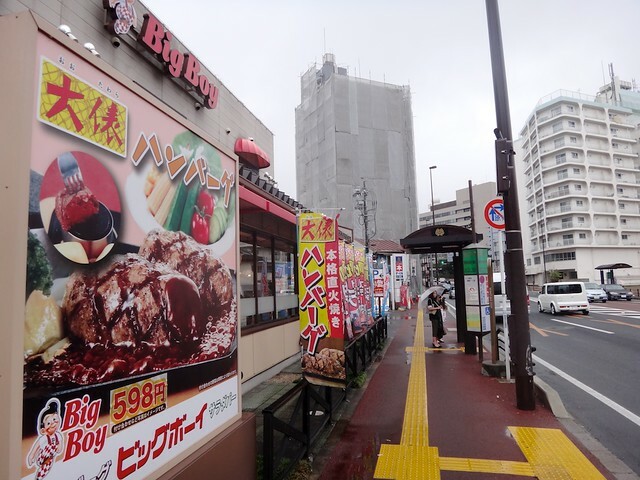 PB makes it very easy, they provide all transport (to and from Shinjuku), necessary equipment and even almost all food on payment of a nugatory ¥1000. Over five months have passed since the earthquake and tsunami of March 11. 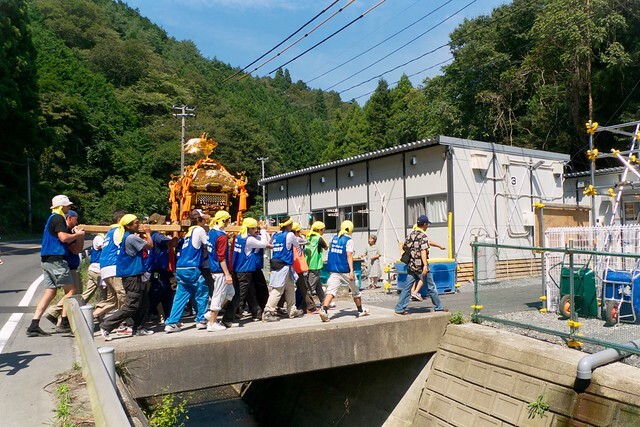 Volunteers continue to be vital for the recovery process for the people of Tohoku. Their presence not only supports the physical recovery of the towns but also gives the local community the encouragement to rebuild. 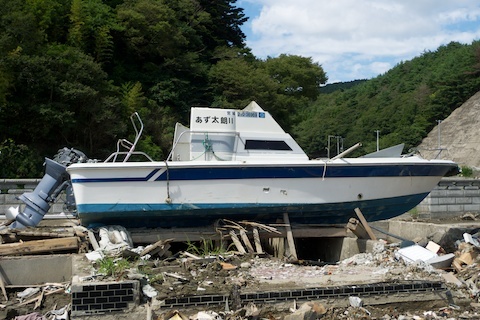 Peace Boat has been working hard to build a strong relationship with the people of Ishinomaki since March 17 to ensure that all volunteer work matches their needs and requests. 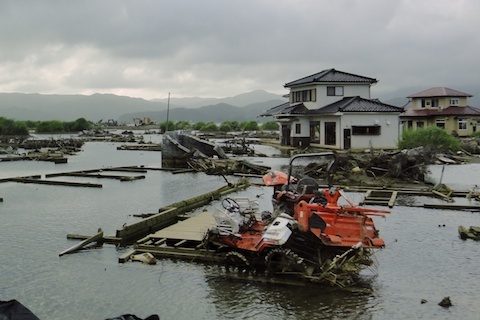 We hope you will be able to take the time to show the people of Ishinomaki and Onagawa that they have not been forgotten. PB's info about volunteering is here with details of the current planned trips. Actually conditions are rather less harsh than indicated - feel free to email or comment if more specifics are required. 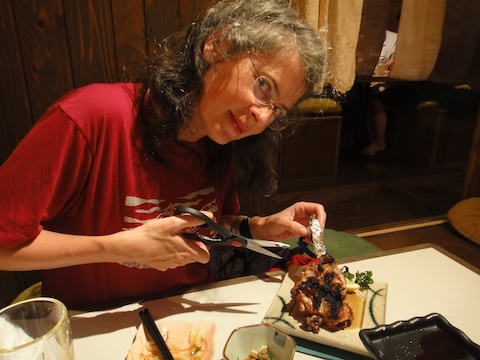 The reward for successfully taking a tandem on the Shinkansen was a succulent steak in ugly rainy Sendai. 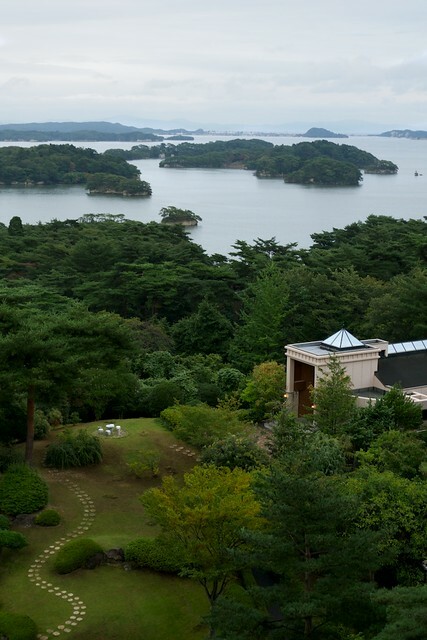 View from our hotel room in famously beautiful Matsushima Bay. 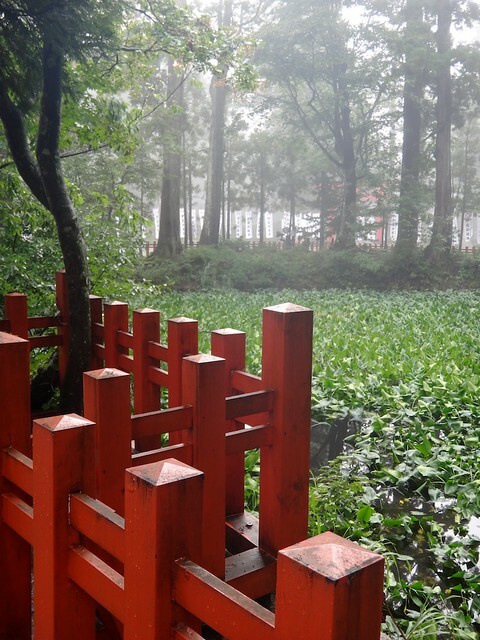 Then into the countryside, where the shrines are a little more rudimentary. It was still raining. Hard. 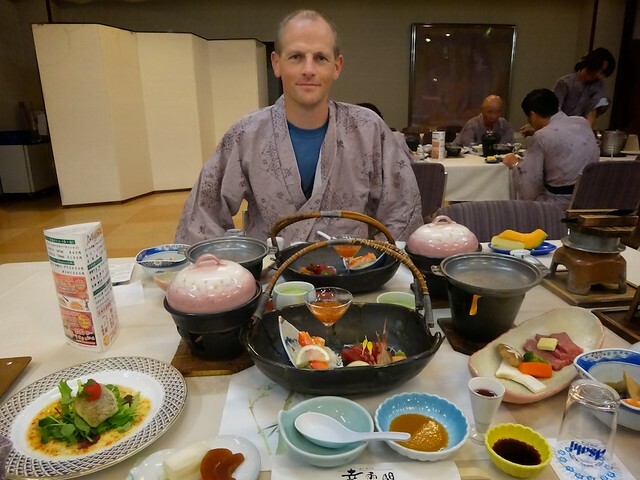 At Naruko Onsen there was no shortage of food, baths and towels for hungry wet cyclists. On the road in the rain to somewhere... 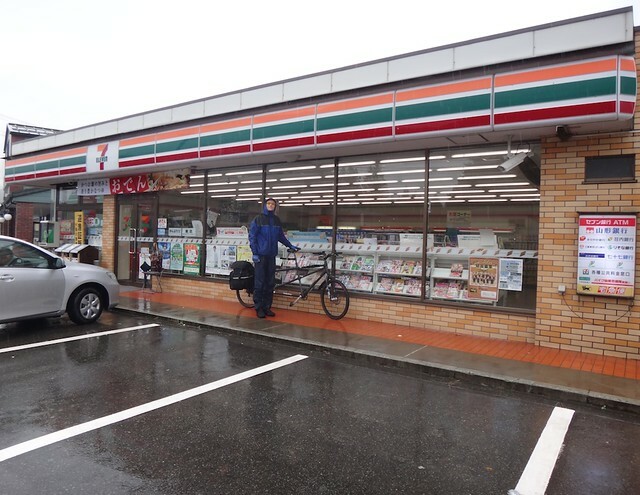 Convenience stores appeared as shining havens. The normally inedible hot tinned coffee and snacks became delicious. And they had pristine dry toilets. We had 2 rooms. 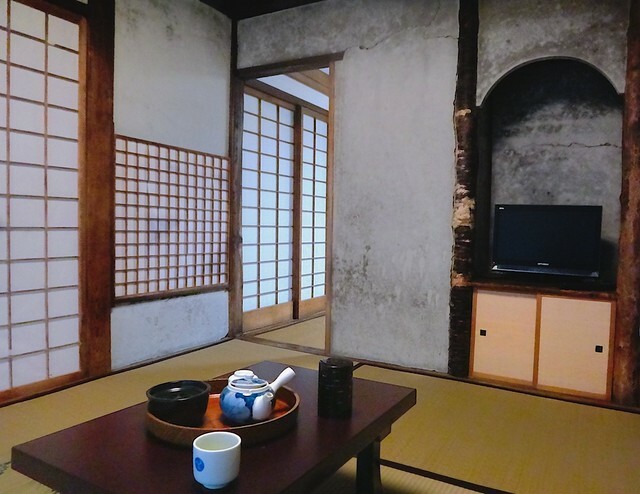 A bedroom and a tearoom. The building rattled in the wind but the tired tandemmers slept soundly through the typhoon. Touring the temple (Actually the first shot below was taken on the way out on Day 5). 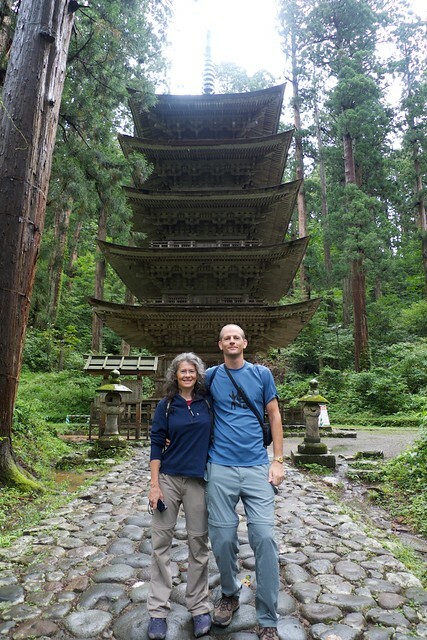 Pilgrims should climb the 2446 stairs to the shrine on the top of Haguro-san, but this was hardly practical with a loaded tandem so we had innocently headed up the toll road. Thus we climbed down and back up. There were lots of trees and things, and it didn't rain all the time. 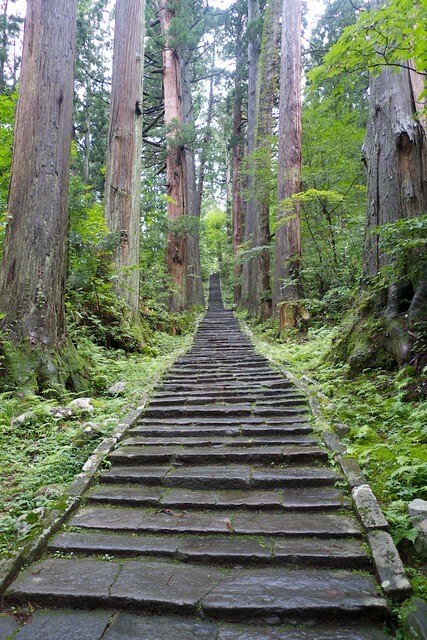 To prove we did it, here's a five-storied pagoda sits near the bottom of the stairs. 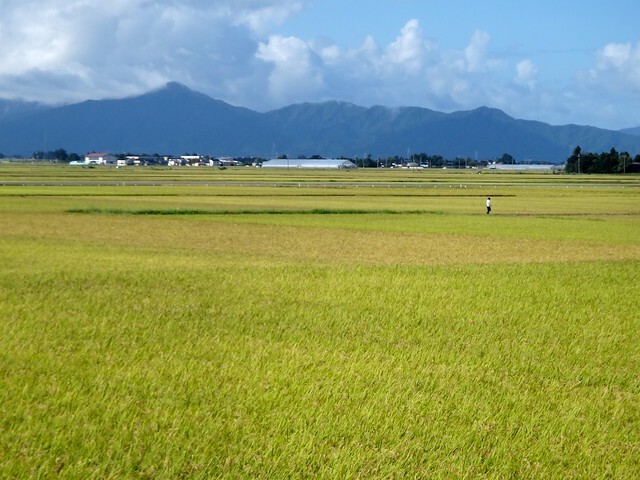 As we headed home the sun came out briefly, and the rice fields started to glow. 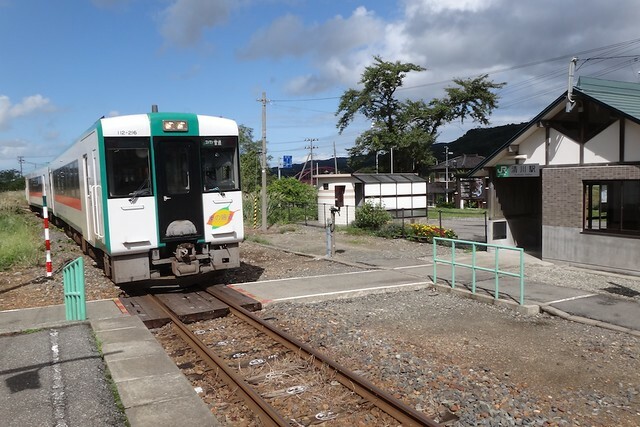 The local railway station at Kiyokawa was unmanned and unmachined. We didn't pay a penny until we got off the Shinkansen in Tokyo. Tearoom, originally uploaded by julesberry2001. 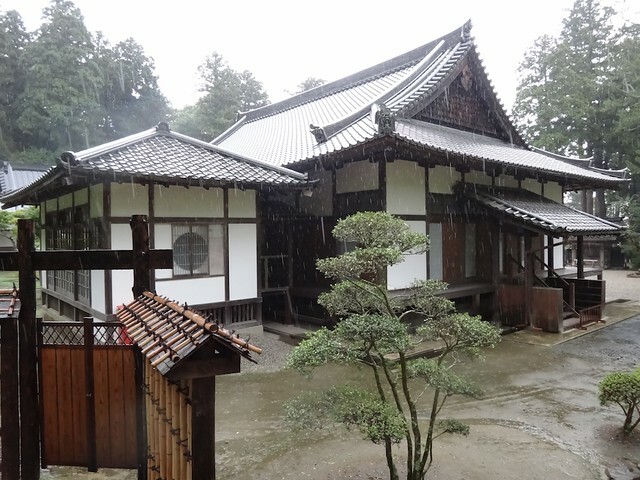 Fortunately we had our own private wattle and daub tearoom from which to enjoy the typhoon. 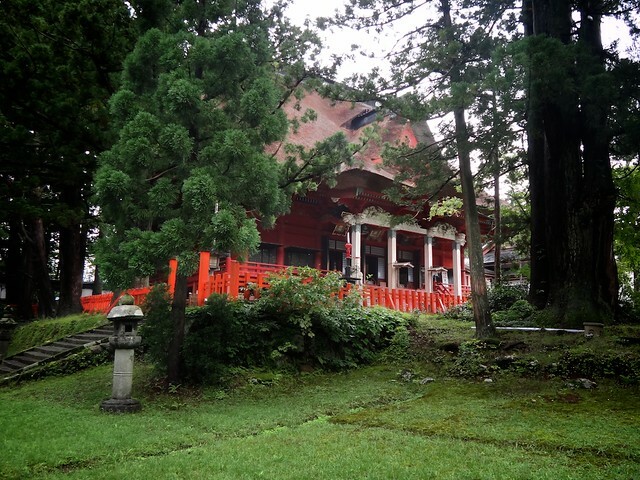 In fact it is practically our own private temple. It is so nice decided to stay a second night. Must remember this clever way of dodging the crowds and often go cycling when a typhoon is due. 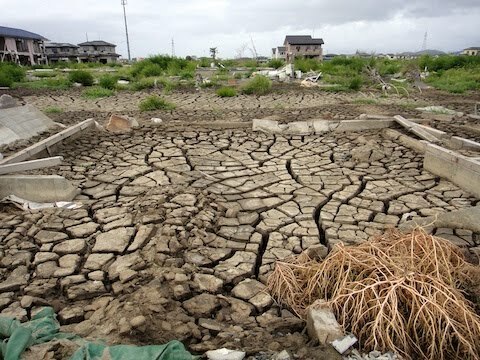 The only problem is that it is still raining, which is not supposed to happen - after weathering a typhoon one expects to be rewarded with bright clear skies. The Big Wet, originally uploaded by julesberry2001. 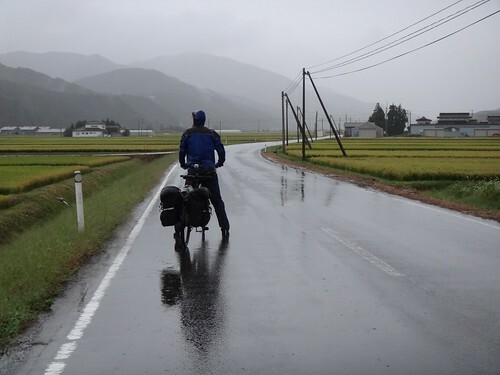 With two typhoons approaching we thought it was a good time for a cycle tour across Tohoku. After 210km of continuous rain we are safely ensconced in a rickety draughty temple lodgings at the top of a small mountain all ready to sit out the storm tonight. It's just starting to get a bit windy. My supposedly rugged camera turned out to be not 2 weeks of volunteering proof, and is now unusable. Thus a shiny new toy arrived on Friday evening and it passed the salty splash proof test on Saturday morning. Kamakura beach is presently almost as dirty as some of those up north, thanks I suppose to the typhoon a few weeks ago. Lots of rubbish and even whole trees have been washed up and half buried. 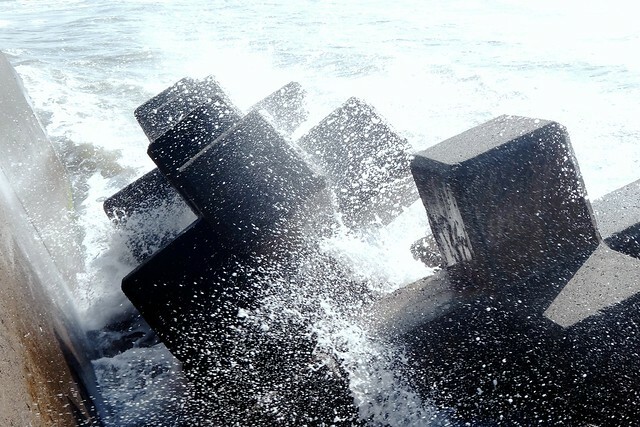 Is it possible we are getting tsunami rubble? We shouldn't really get too much as, in terms of ocean currents, we are upstream of Tohoku, but perhaps it is possible - the ocean is a more complexly swirling place than our simple models pretend. 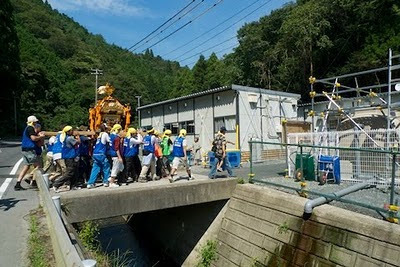 Now you've read the post all about the festival, the carrying of the mikoshi around the town and out to sea, this picture may have some meaning. 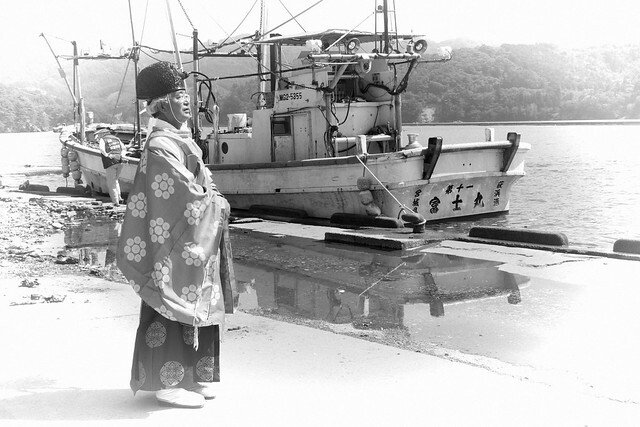 It shows Oginohama's Shinto priest and one of the fishing boats on which the livelihood of the village depends. 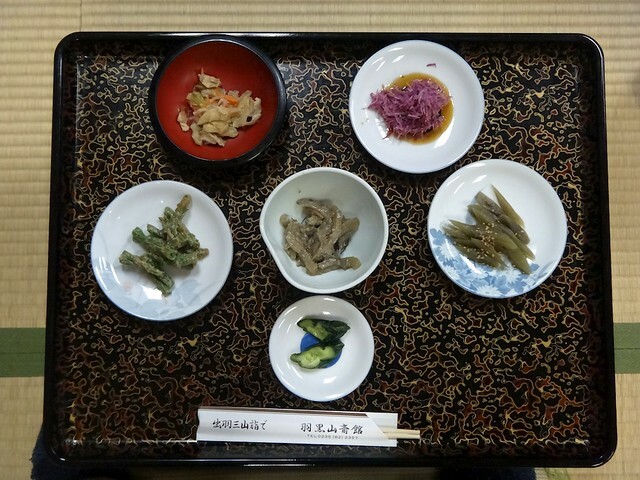 We had another week in Ishinomaki recently. It wasn't quite as much fun as the first time, but perhaps that's only to be expected after I had spent so much of the previous week splashing about on a boat. [Incidentally, another set of blog posts on our previous week from another volunteer's POV can be found here.] As I mentioned before, we had been planning 2 weeks volunteering, followed by a cycling tour. But Peaceboat rather bizarrely forbade it, so we just went up for a single week, a little apprehensive about their penchant for arbitrary rules and inflexibility. Of course, the advantage over self-organised volunteering is that they do provide a high level of support which makes things very easy. A typhoon was approaching as we went up on the Friday night, so instead of camping, we were taken to the abandoned factory ("Kasuka Fashion") where Peaceboat had been generally housing the short-term volunteers. 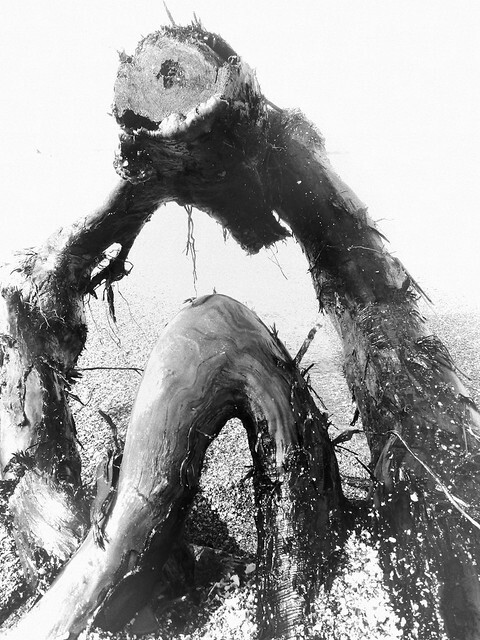 It had been flooded to a height of about 5' 6", according to the tide mark on the walls. So I'd have been fine! The weekend group who were originally going to stay there had had their trip cancelled, as the weather made it unclear if they would be able to work, although as it turned out we had nothing more than some showers and a stiff breeze. 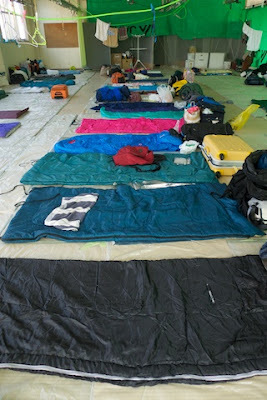 Even after the typhoon had moved away, we stayed put and other groups went to the campsite. The factory had some notable advantages - electric lighting in the evening, hot showers, and a wider range of shops and restaurants within easy walking distance (we were close to the border between tsunami devastation, and business pretty much as usual) - but the campsite had been rather relaxing and pleasant, at least now the memories are fading of the hot sleepless nights and 4am dawns! Our group was also rather younger than previously - a higher proportion of English (conversation) teachers (think Charisma man) and students, compared to the mid-career (ok, middle-aged, if you like) expats who we had mostly worked with previously (though if you follow the previous link, you'll see that we weren't all oldies). Not that there is anything wrong with youthful exuberance, Peaceboat obviously relies on it to a large extent (albeit with some resulting naivety). But it did mean we had a bit less in common with them, and it sometimes seemed like this group were more interested in each other than in their surroundings, which although slightly neater than last time, still had huge areas of devastation. The first couple of days we were clearing up around a couple of houses in Gozo, near to Nagatsura. This area had only recently become accessible following the reconstruction of a bridge, and the houses were beyond repair so our goal was really just to make things look a bit less devastated for those trying to re-establish their lives. 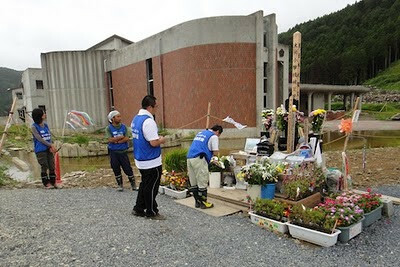 On the way there each day we passed the elementary school at Okawa where 74 pupils out of about 100 had been killed. There's a big hill right next to the school, but probably no-one expected such a big tsunami 4km inland. 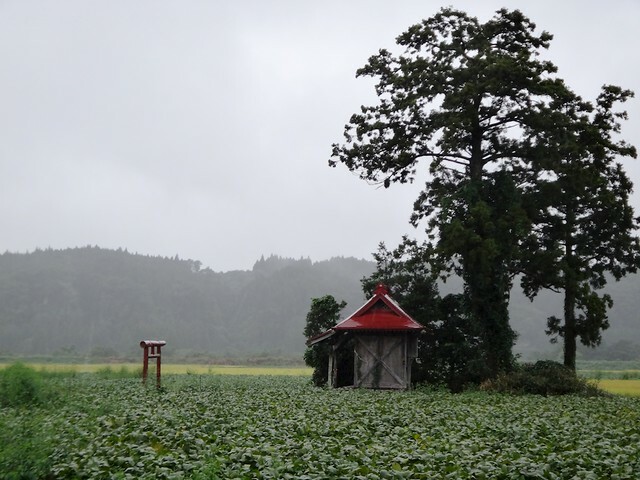 The rest of the week was spent in the small village of Oginohama, preparing for an annual festival. Jules has already covered this in some detail, and there is also the official Peaceboat write-up here, so I'll be brief. As jules said, while it was worth doing, it seemed to us like rather too much effort for relatively little benefit. We could easily have got things into a reasonable condition in half the time and then done something else useful with the remaining days. Some other groups of volunteers were helping to establish some seaweed (wakame) farming which sounded rather more productive and interesting. As it was, by Thursday afternoon we were hanging around looking around for things to do and ended up clearing up a nearby stretch of beach. We did try to tell the leaders that we would prefer to do something more useful, but it fell on deaf ears. I realise that we aren't really there to enjoy ourselves, but we were all donating our time and I don't think it is unreasonable to hope that we should be gainfully employed. One of the organisers did admit after the event that perhaps it was a little excessive. Taylor Anderson's family turned up one day and joined in with the volunteering (not actually working with us, but some other Peaceboat group). Introduced to us only in Japanese, I didn't realise then quite what was going on there, but as the link tells, she was an (the only?) 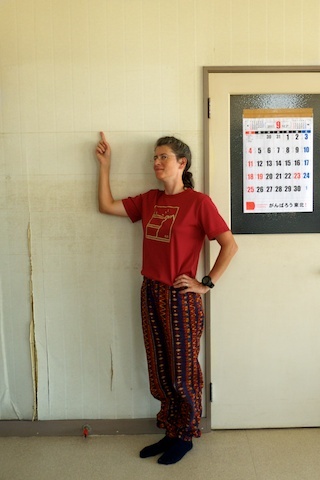 American who had died in the tsunami, right there in Ishinomaki where she was working on the JET program. Friday was festival day, and we got to carry the mikoshi around what remained of the town to visit the handful of buildings that were still standing (and the emergency housing that has now been built). We also sailed out in a convoy to pray for the oysters. All in all, it was fun, but it felt a bit excessive. Interestingly, one of our team who is staying for a longer period, seems to have moved over to one of the ad-hoc volunteer groups who are still camping at the University (until the end of the month, when the site is closing). I wouldn't want to put people off too much - it was still an interesting week and Peaceboat does make it really very easy for volunteers - literally all you have to do is pay ¥1000 as a small contribution towards costs, for which you get transport, food, accommodation, and necessary tools. Following on this ridiculous story (not to mention the temporary TEPCO worker who died of leukaemia within a few days after starting work at the plant, where he didn't even go near the radioactive bits). They have been planting a lot of sunflowers up north, perhaps partly because they are tough, bright and quick-growing, but also there has been talk of them soaking up radioactive contamination (which doesn't seem to work so well, but never mind). Now to my mind, a sunflower has a single big flower head on the top of a stalk. 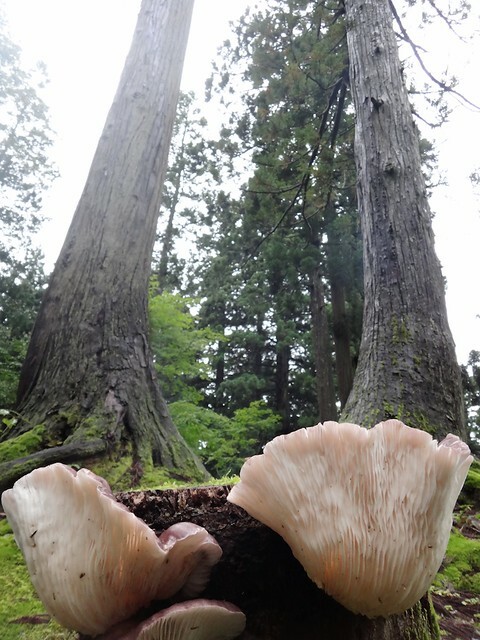 However, the ones up in Tohoku are growing multiple heads! And they were waving and shaking at us if we came too near! 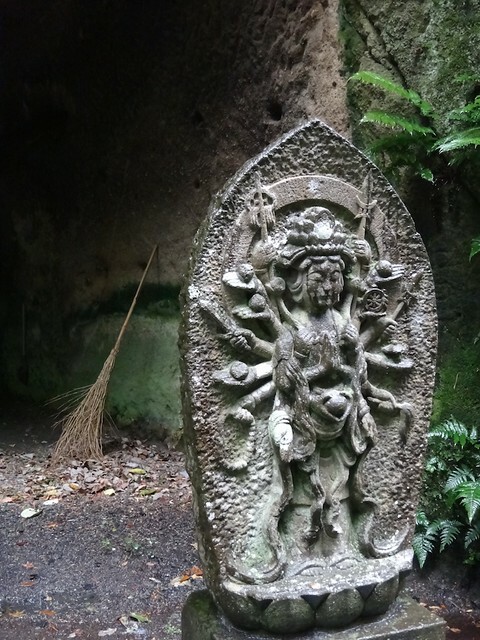 As I mentioned previously (here and here) our main volunteering task last week was cleaning up a shrine. 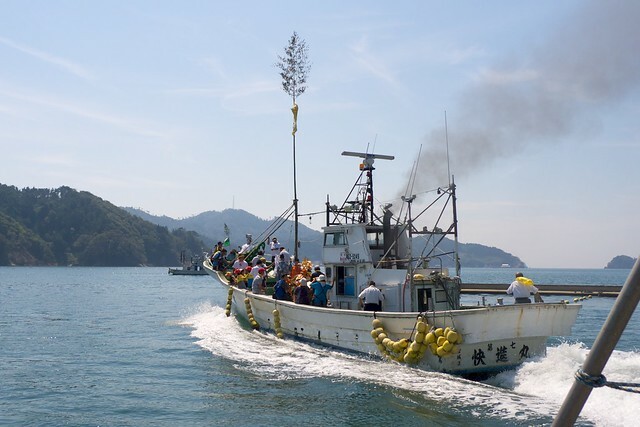 The annual festival in the little fishing village of Oginohama was scheduled for the Friday but there were not enough people left in the village to put on the event. So Peaceboat took on the task. They cleaned in the shrine building, around the building, all 200 steps and their verge and also the area at the bottom of the stairs where Peaceboat volunteers cooked lunch afterwards. James I and felt that with so many volunteers and 4 days, we could have cleaned 4 shrines. So we worked hard in the hope of getting a different task later in the week. But that wasn't how it worked. Instead, they just cleaned unnecessarily deeper! Actually our small team of 5 was the only one that happened to go to the shrine all 5 days (4 days cleaning plus the matsuri itself), so that was a little unfortunate. 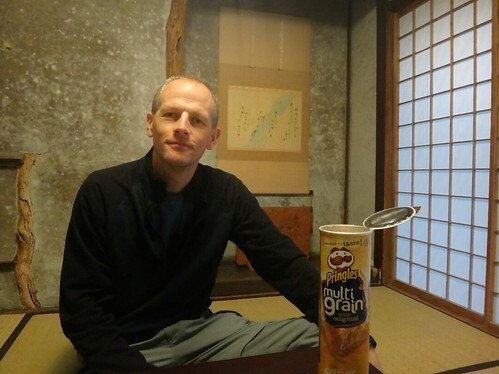 Apart from the over-manning, which actually is a typical Japanese approach to a problem, the goal was reasonable enough. Most of the sludge has now been removed and building deconstruction must be done by professionals. Meanwhile the surrounding desolation must be very depressing for those living there, so getting the shrine back in use and putting on a meaningful and fun event felt right. Peaceboat also overmanned the matsuri itself. It would have been nicer had the locals (about 35 attended) not been outnumbered by volunteers! Here are some photos. 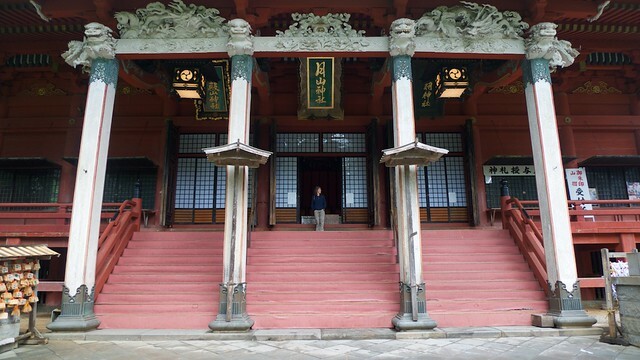 First we went up to the shrine building where an hour long service of the priest singing was held. Apparently the goddess protects the village from the sea and keeps safe the boats and fishermen and that sort of thing. We think she should be sacked. 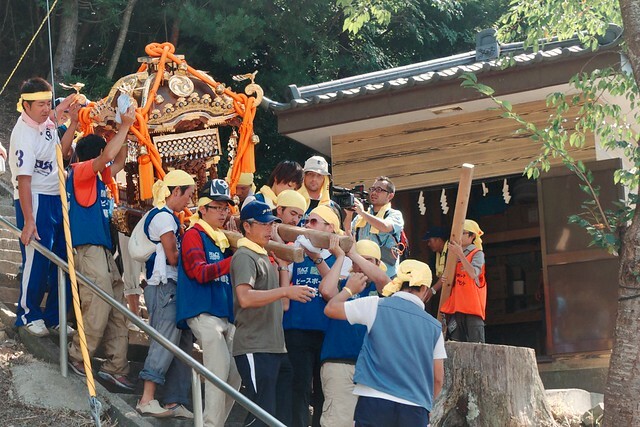 Then the mikoshi was taken from its little shed and taken to visit all the houses in the village. I suppose this is to symbolise the goddess visiting and blessing the village. The mikoshi is taken from the shed. It is quite heavy and naturally only men can carry it. I suppose that otherwise their willies would shrink away to nothing. Visiting the houses in the village. Almost everyone (about 10 families?) 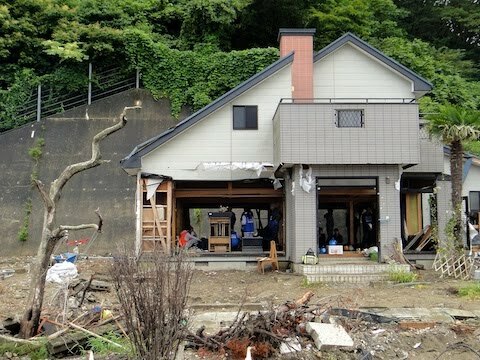 seems to be living in these temporary houses a couple of minutes walk up the hill from the shrine. Even James could not carry the whole mikoshi himself, so, being a foot taller than most, had to adopt a different carrying style from the others (that's him at the back). We walked through the "old village", empty lots, rubble, diggers. 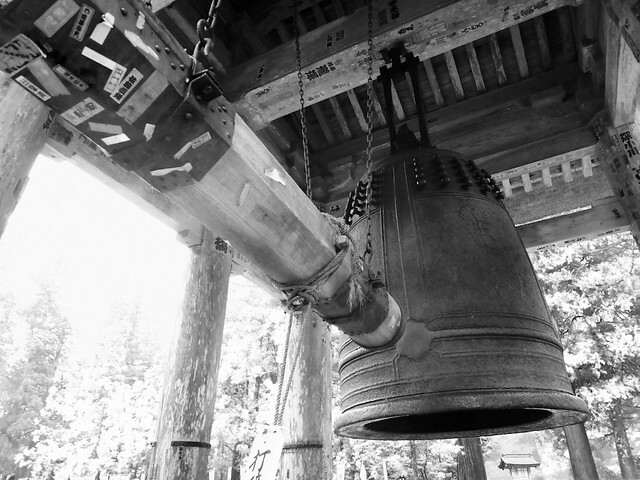 I usually despise shinto for its encouragement of superstition among the population, but this bit was actually rather moving. The guy with the black hat and prayer stick is the priest. Then on to the fishing boats. 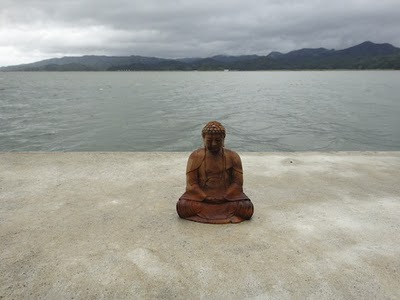 The mikoshi was taken out into the bay where a twig was thrown and some sake was poured into the sea. The volunteers not involved in mikoshi carrying, followed on 3 other boats, where some fun swooping around and racing went on. Then everyone retired to a tent outside the former "city office" where a late lunch was served. This was fun to do as it was a BBQ. 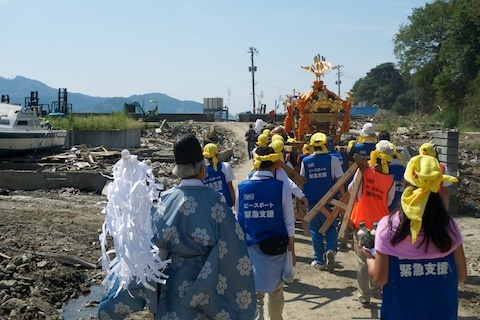 And there were so many volunteers that we (non-mikoshi carriers) only had to stand in the raging sun over the hot coals for about an hour each. Afterwards, a curious game. The priest took the first go and was curiously good. He makes it look too easy - later contestants really struggled to stay upright and walk in right direction and required a lot of help from the audience. 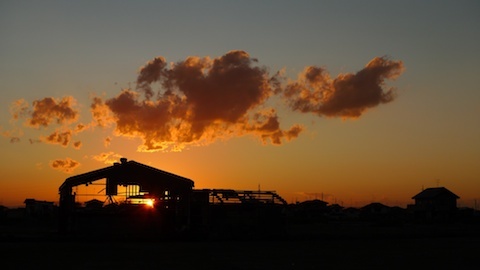 Ishinomaki, a set on Flickr. I've made a set on flickr of my photos from Ishinomaki and around. It includes photos from both trips, 2 months apart. A huge amount of clearing up has been done, but there isn't much sign of rebuilding yet.